With the recent weather a lot of snow and ice have covered the state of Maryland. But where there is snow and ice, the risk of a slip-and-fall accident in Annapolis increases exponentially. You have to know your rights if you get hurt because of snow or ice in a public place. With the help of your slip-and-fall lawyer from Annapolis you can file an injury claim and receive compensation for your injuries. Usually, slip-and-fall accidents happen on the sidewalk or in parking lots outside of a business. The property owner of that place has a duty to exercise reasonable care and maintain the areas by removing the ice and snow, thus reducing the risk falls and injuries. The landlord or housing association may also be liable if it is stated in the lease. You can determine this by providing your slip-and-fall injury lawyer with your lease. 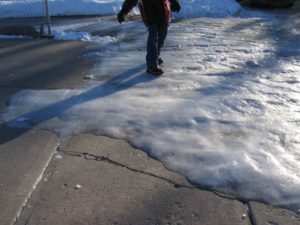 If you get hurt in a slip-and-fall accident on ice you may be able to recover compensation in Annapolis for the medical bills by suing the property owner, the landlord, housing association or even the contractor responsible for clearing away the ice and snow. You may also recover lost wages by demonstrating your injuries caused you to miss work, as well as compensation for the pain and suffering you had to endure due to your injuries. If the injury has had an impact on your regular activities, such as chores, exercise, and others, then you may be able to recover compensation for the injury itself. Usually weather conditions change frequently, so it may be crucial to document as much information about the area of the accident as possible. You can also take photos of the area of the accident and around it. Snow and ice should be cleared regularly, so every piece of evidence can help your slip-and-fall injury lawyer from Annapolis to prove the accident was not your fault. Depending on the temperature outside, different materials may be used. In addition to this, some ice removal materials have to be reapplied regularly to continue to be useful. You can also assist your lawyer with witness statements from people who saw you get hurt. First of all, a professional injury attorney knows the slip-and-fall law in Annapolis regarding snow and ice and can make sure you don’t take any wrong steps that could jeopardize your case. In addition to this, your attorney can provide you with expert witnesses which will provide the court with the information needed to prove the defendant’s liability. Having a series of expert witnesses on your side is a great advantage and it may prove hard to get the right experts without the help of your lawyer. For more information about getting hurt on snow, ice, or black ice you can contact the best slip-and-fall injury attorney in Annapolis at (443) 569-3950 or send an email to [email protected] to file a claim and get the monetary compensation your need and deserve. Free consultation of your case.